With a spectacular 270-degree view our fragrant harbour, Ambrosia is a classy place. It serves up more than a dozen different types of oyster, most of them hailing from France, like the Gillardeau No 1 ($88), the Belondine No 1 ($78) and the Belon 0000 ($128) – but there’s also the Irish Majestic ($88). However, the Pinky No 0 ($128) is the most popular. This bivalve spends three years in the Mediterranean before being sent to mature in a tank in France to give it a long, sweet aftertaste. Named after its distinct pink shell, it’s quite a mouthful – almost the size of your palm. The ‘No 0’ indicates that on the four-tier scale of oyster size, it’s the largest and takes the longest to mature. Ambrosia’s personal favourite, though, is the Ostra Regal No 1 ($88). This oyster is quite the traveller as it starts its life in France before moving to Northern Ireland, then Southern Ireland, and back to France for the last six months of life. The Regal is a phenomenal blend of sensations, with strong seawater flavours and a sweet aftertaste. 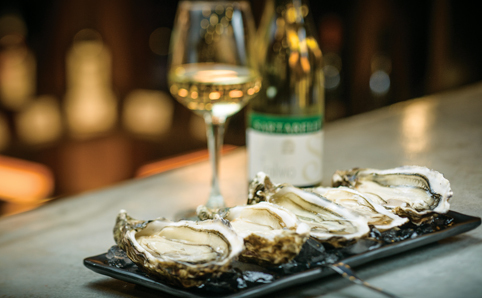 To pair with these, Ambrosia recommends the Loire Valley Chateau de Sancerre from France – the full-bodied texture and long finish helps balance the acidity of the oysters. It’s $160 a glass and $720 for a bottle. The Oyster was traditionally just a popular wholesaler but its first bar-and-restaurant venture in Central has been a hit of late, welcoming people to try reasonably priced oysters on the premises alongside a fine selection of wine. It holds some niche finds too, like La Royale Cabanon ($42), the Isigny ($36) and the Pousse Speciales ($42). But the most noteworthy variety is the Saldanha Bay ($20) from South Africa. The bay forms part of the Benguela large marine ecosystem which provides nutrient-rich waters for the growth of phytoplankton, and experts claim that oysters here grow three times faster than their European counterparts. It’s a plump mollusc and tastes sweet-yet-salty, much like the rich waters where it was harvested. The French St Vaast ($50) oysters are also worth a try. Rich in ocean flavours with an almost crunchy texture in their skirting, these pearls leave a sweet aftertaste when the salty flavours pass. As for the wine, The Oyster recommends Titiana Cava Vintage Brut Nature, Cava 2007 ($388), which releases a high volume of dense bubbles to the surface of the glass. It’s dry and full-bodied, with a light, toasty finish to bring out those ocean flavours. The past 12 months have seen a new delivery trend in the city – the oyster home delivery service. This desire to shuck-at-home has prompted online seafood delivery service Ocean Three to open its third shop – its first on the Island. And there are lots of varieties to choose from, like the Gilles Masse ($28), the White Foam No 2 ($25) or La Maison ($30). The meaty Sea Princess No 2 ($25), with its long-lasting mineral aftertaste, comes with an intriguing story – as legend has it, a princess committed suicide by jumping into the sea where these oysters are farmed back in the Seven Years’ War in France (1754-1763) after finding out her lover had been killed. Pair a Sea Princess with the exclusive Sartarelli Verdicchio, a fine Italian wine, which is well balanced and has hints of honey and peach, without being too sweet. It comes in a half bottle for $138 and $238 for a full one. Oh, and if you’re having some shucking trouble, Ocean Three also offers oyster shucking classes for $288 a pop. As the name suggests, Petite Oyster is bijou and cute. The Sheung Wan spot sports high ceilings and creates a clean, rustic cottage ambiance with its white-paint brickwork, bell jar pendant lamps and simple wooden chairs parked at marble-topped tables. This homely atmosphere certainly whets your appetite for oysters and wine. The restaurant strongly recommends the Fine de Claire verte ($38), an oyster known for its distinctive green colour after its time spent with the naviculus micro algae, which is filtered by the mollusc as it retains the pigment. 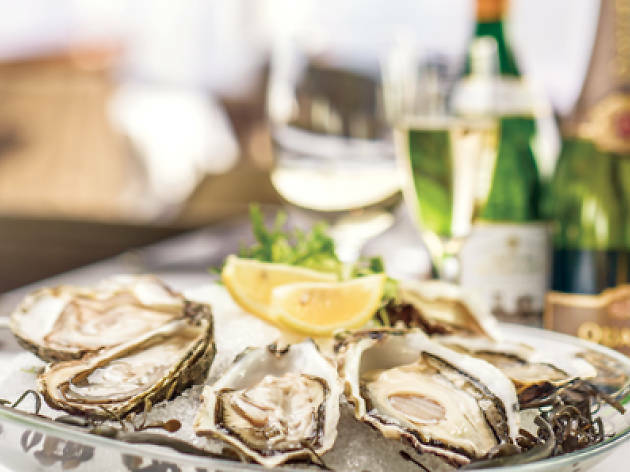 This breed is a particular French delicacy as only four oysters are farmed for every square metre of ocean – hence it’s heavy in flavours of the sea, as well as also boasting a hint of sweetness. Other favourites at Petite include the Ostra Regal ($38) and White Foam ($38), with the latter being farmed for three years in Ireland before being shipped back to France for six months, giving it a more complex and layered taste, a little fattier and sweeter than most other varieties. 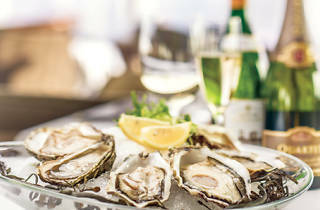 The venue recommends the Sancerre Blanc, Domaine Michel Girard 2011 ($328) or the Chablis, Domaine Besson 2010 ($338) to pair with the oysters as the acidic and mineral notes of the wines uplift the saltiness of the seawater as well as bring out the sweetness of the oysters without overpowering their natural essence.